There are two people in every photograph. Said the great Ansel Adams. And these two people are the photographer and the viewer. Which, in other words, means that what is seen from behind the camera can be interpreted differently when seen from in front of the camera. 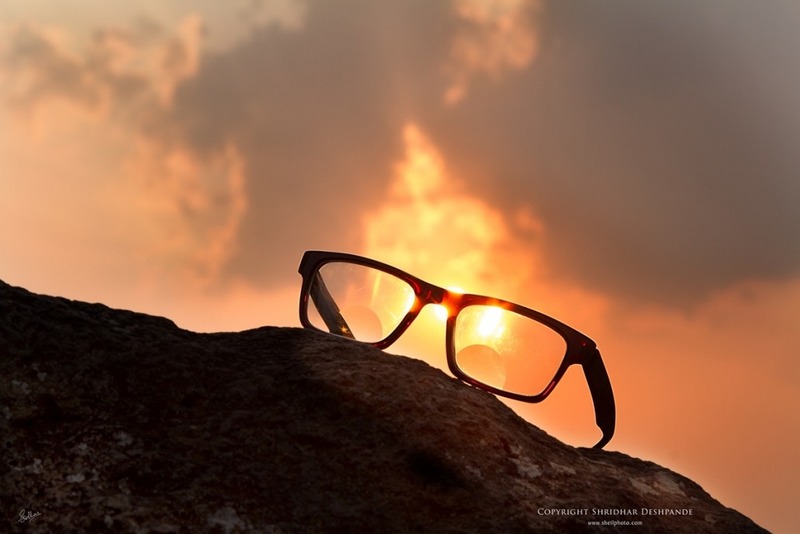 One day I was walking on a hill, with a book in my hand, and appreciating the lovely colours of sunset through my glasses. And I wondered if there are two people in everything that I see! Me on one side of my glasses and the world looking at me across my glasses. This is even more interesting. I thought it would be a good idea to see the things from both sides of my glasses. So came out my camera. The above photograph was taken on a small hill in Pashan area of Pune, India. As you may notice, I have bifocal reading glasses. Which means that there is a circular part of the glass on the lower side that has different nature. It helps you read things clearly. It also seems to have a different type of transparency. I am on my side of these glasses in the photograph. I don’t really see the frame or its colours. The reading part of the glass seems to hold the sun within its boundaries. A bright vision! Am I trying to read the Sun? Then I go on the other side and rest my glasses on my book. It looks like the sun is going to see through my glasses to look at me. But the sun is not wearing the glasses as yet. This is very different. I am on the other side of myself and the sun is on my side but not exactly seeing like me. Maybe this is what is called a third person viewpoint. And then as the angle changes, looks like the sun has worn my glasses. It is probably looking at me the way I look at it. And then I see the rich colours of the frame. The Sun no longer seems to be contained within the reading area. I have no clue what the sun is seeing. 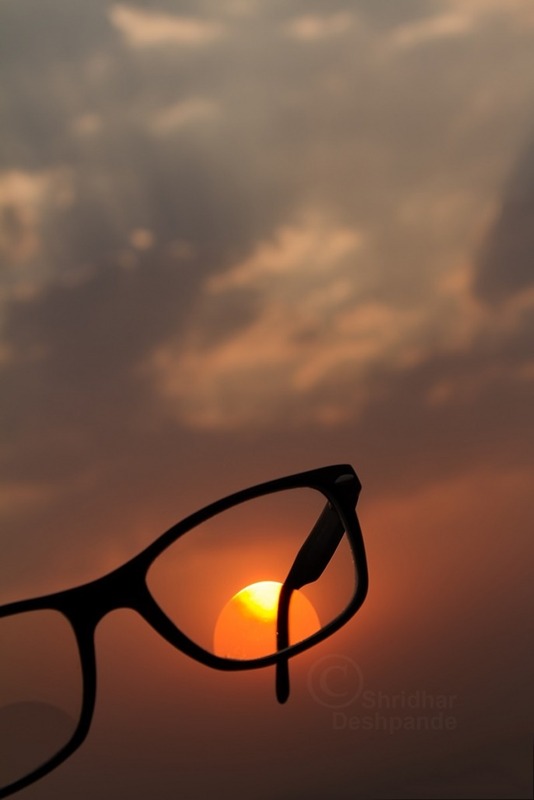 But I have a feeling that it is appreciative of what it sees as much as I am while I am on my side of the glasses. Maybe all this is not making a lot of sense. But I believe this is how it is supposed to be. Like many things around us that just feel but cannot be articulated. There is more fun in living with the mystery than trying to solve every little riddle. Photography helps me find and live these little mysteries. 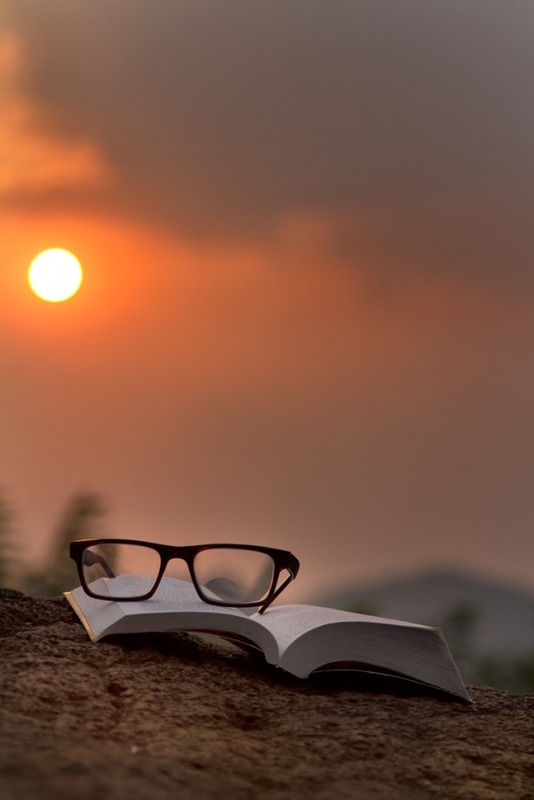 Glasses, book and the Sun . The three things that have impacted me the most and gave me a vision to see things with a different angle. Teaching me to make the mundane richer as the photographer.